Think you've seen every picture of The Beatles and The Rolling Stones? Think again. The Not Fade Away Gallery in New York City is hosting an exhibit called The British Are Coming, and the previously unseen shots of The Fab Four and Five are truly astounding. The photographs were taken by the late Bob Bonis, who served as a road manager for both bands during their tours of the United States from 1964 to 1966. Bonis's son, Alex, found the negatives in a duffel bag that also included candid shots of other music icons such as Simon & Garfunkel, Cream, Frank Sinatra, Buddy Rich and The Hollies. "I grew up with these photographs in my family's living room and in my Dad's office," Alex said recently. "They were part of my everyday life and now they're out there for the whole world to see." Many of the images capture The Beatles and The Rolling Stones in casual, lighthearted moments on tour in America. There's Ringo and Beatles road manager Mal Evans goofing around with a toy pistol (eerie now, considering Evans was tragically gunned down in 1974); then there's Brian Jones and Keith Richards sipping drinks poolside on the day Richards was said to have written the riff to (I Can't Get No) Satisfaction - no wonder Keith is partying! And what to Mick Jagger and Richards in a truly absurd pose somewhere in the US? Insert your own caption here. 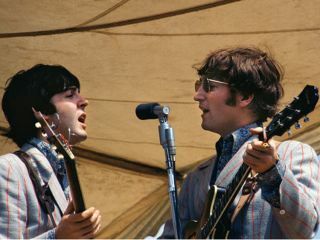 In addition, the collection contains stunning shots of The Beatles both onstage and tuning up before concerts. The British Are Coming exhibit will run at the Not Fade Away Gallery until 17 May. Can't make it? Well, you can visit the official Not Fade Away website to browse through the photos, many of which are available for purchase in a limited edition run of museum-quality prints on vintage paper. "Rare Beatles photos show up all the time," Beatles expert and former music journalist Steve Marinucci told Newsweek, "but not usually in this quality."